Precious metals are extremely popular right now, with investors flocking to the intrinsic safety of precious metals like gold and silver. Penny auction sites have gotten in on the act by offering gold penny auctions nearly every day and penny auctions with silver multiple times per day. These auctions are some of the hottest online, however not all penny auction sites offer precious metal auctions. Some of the biggest bidding sites online do not offer gold or silver and some of the smaller ones offer great shots at winning precious metals. Of the main penny auction sites we list, only Happy Bid Day offers precious metal penny auctions. Many of the other sites have gold and silver jewelry penny auctions but they do not offer up bars of gold, silver coins, gold coins or silver bars. Here is a screen shot of the gold bars won in a penny auction site, SkoreIt. You can find the gold for auction at HappyBidDay by clicking on categories > jewelry / fashion. Let’s take a closer look at what kind of gold and silver you can win at HappyBid Day penny auction. 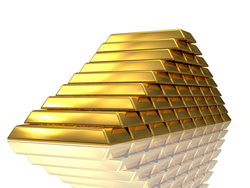 2g bars of gold auctions– these auctions happen a few times per day normally. You can find the first auction running in the early afternoon. Then, later that evening there are usually two more, 2g gold bar penny auction. 1oz silver bars – These happen daily and spread through out the day with a few more in the evening times. A friend of PennyAuctionSites.com has won a 2g bar of gold from HappyBidDay and received it lightning fast in the mail. Winning gold at penny auction site Happy Bid Day is a real possibility if you are patient and willing to spend time at your computer. These are some of the bigger fights and it is not out of the ordinary for these auctions to go deep, however we have seen them close with only a handful of bids and huge savings. Talk About Good Deals On Gold Coins – 1oz For $50?? If only he would have asked you or I, right? There are a handful of sites out there offering precious metals in their auctions and most of them are not currently listed as one of the safe penny auction sites or as one of our top listed sites in any category. That does not mean that they are not safe, it just means that they have not yet been researched and reviewed in depth enough to be listed there. By most accounts, the sites mentioned on this page are fairly trustworthy and honest penny auctions. There is even one newer penny auction site called Bid Wealth that is only offering gold and silver penny auctions (and bid packs) and they only have auctions once every few days per week. However they have a wide range from down to 1/25th oz of gold up to a quarter oz gold coin. This site is only offering gold and silver and in my opinion it is going to be a hard nut to crack because there is no real way to buy gold and silver at a discount. We have only recently found out about this site and are in the process of evaluating and researching them more in depth. Hopefully this site is legit and will be a good spot to find gold and silver to bid on. Skoreit! is another quality penny auction site that offers gold and silver and they have a nice variety of auctions for precious metals. There are some gotchas to watch out for before bidding on precious metals here as the competition is heavy and the ‘buy it now’ option is not the deal you might think it could be when it is offered on their precious metals. The catch is, None of the precious metal auctions are buy it now, aka OT, unless they attach a ‘proof like coin’ that has little base metal value, or some other trinket that inflates the buy it now price to much higher than market price for the metal. This means that the few non OT auctions are usually attacked by the bid collectors who battle and battle for bid packs and build up a ton of cheap bids, which they only use on ‘non-ot’ auctions like precious metals since the bids they win in an auction have very little value towards ot. You can find 1oz silver bars and coins, 5oz silver bars and coins and even a 10oz silver bar (once per day in the evening) auctioned at Skoreit penny site. There is a high volume of auctions here in general. The precious metal auctions are some of the toughest to win, especially since Skoreit! has moved to mostly “OT” auctions except in some of the precious metals which means these are prime candidates for bid collectors to attack. The short answer is because these sites can not purchase gold and silver at much of a discount. The price of gold is the price of gold… sure it goes down ever so slightly in volume but not enough to really be able to get a big discount like they can on things like jewelry, gift cards, tv’s and the like. This also means that they have to do something to inflate their buy it now prices or the bidders will complain that the prices are too high in comparison to actual retail price for the site to profitable auction gold off using the penny auction pay per bid model. Anyone can go to the American Precious Metals Exchange and buy gold and silver at the same price as most of the penny auction sites can and buying things at steep discounts is a core component of running a successful penny auction site business. Doing that while auctioning off gold and silver is not really a possibility so many penny auction sites have avoided it. Let’s be honest, it never hurts to win some real gold or silver! Penny auctions can be a great way to get your hands on physical gold and real silver. These sites will mail you your winning and normally they are in small enough sizes for you to easily trade and or sell them at any given moment. Gold and silver is liquid and considered a true store of value, which is a nice thought in the troubling times we live in today. Here are some specific penny auction strategies to win gold and silver. Do not spend money you can not afford to lose. If you really need the gold or silver in your hands then spend it at APMEX (American Precious Metals Exchange) and there you are assured to get your metals. As penny auction sites continue to come on the scene with gold and silver up for bid we will update this page with current information. Win a 2g Gold Bar at HappyBidDay.com – Click Here for 20% Off 1st Bid Pack Purchase! I just came across a site called GOTTASH.com. Its a penny auction site and all it has is GOLD, and Silver oh by the way cash. Really cool check it out. Shopping on auction sites is one of the best ways to save money oinlne. If done right, you can purchase expensive goods, such as jewelry or electronics for incredibly low prices! However, before you start bidding, you should have a basic understanding of the oinlne auction process, in order to avoid getting involved in fraudulent activity.